-> How to avoid churn due to bad payment cards, including dealing with expired cards. -> Proven best practices for all aspects of retention, including how to re-engage “sleeper accounts”, how to make onboarding more powerful, how to improve email newsletters, how to retain more group accounts, and how to use advanced analytics to pinpoint and solve retention problems. -> Legal advice for US sites offering auto-renew. -> Retention marketing samples from Angie’s List, Carbonite, ConsumerReports.org, Dropbox, FreePlants.com, Golf Odyssey, GoToMyPC, Metals Economics Group, MyCorporation, Monster, Netflix, New England Journal of Medicine, The New Yorker, Rivals.com, The Satellite Broadcasting & Communications Association, Sports Betting Professor, Website Magazine, and WhichTestWon.com. 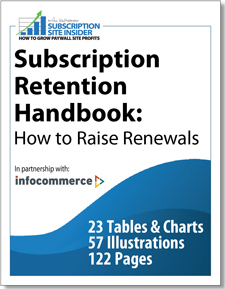 The Retention Handbook is based on exclusive Case Study research by the editors of Subscription Site Insider, together with insights from the advisory team at InfoCommerce Group. Data charts are based on our survey results of 151 online subscription publishers. This Handbook is for serious professionals in the online subscription industry, as well as traditional media selling subscriptions online. Instructions and data for publishers serving the B2B and consumer markets are included. What’s a Normal Subscriber Retention Rate? CHART: Which Onboarding Tactics do Subscription Sites Use to Increase Retention? CHART: What Percent of Auto-renew Publishers Comply with the Law?